The problem here is that they are having a conference. Once you get these cycle loving, sustainability, traffic light, no cars, tax driven morons together you get a self backslapping bullshitfest that buggers up the life of poor ratepayers all over the country. They then elect the biggest dickhead to ensure that the minority view is spread all over the place like a blanket of fog over Christchurch. Lawrence Yule has proven to be the worst leader of this fraternity and [the Mayor of Dunedin] will take us a few more steps downhill. He will win because he personifies all of the problems of local government. Too many employees, no accountability, no technical expertise except in report writing, time wasting, dodgy contracting and car theft. Yes, one of Local Government NZ’s most important functions is to give prizes to its members for excellence. Otherwise known as the Local Government Association of New Zealand, an incorporated society, which claims to be representing the interests of local government in New Zealand. But only the interests of the elected ‘stakeholders’, not the ratepayers who fund it, along with various corporate sponsors and business partners. A gravy-train and a private, non-inclusive, non-transparent forum-shifting device IMO. Local councils banding together, just like any union, in the hope of getting more clout to lobby central government. Not exactly part of the core business of any individual member council IMO. They have a deceptively official-sounding name and probably like it that way. Hard to say which is worse: them or SOLGM, the Society of Local Government Managers. Both examples of organisational input triumphing over organisational output. Should have to be totally privately funded IMO. Walking on eggshells about what public comments are allowed about the DCC. So speaking in a general case, if a local body wants to defend itself in a court case, it obviously has very deep pockets because it has ratepayers’ funds at its disposal. However, if it pursued a defence which turned out to be judged by a court without merit and perhaps also dragged the case out longer than necessary, arguably to increase the financial pressure on the other party to deter them from continuing, or even punish them for trying, then it might appear that the local body had been improperly using its greater financial capacity to deter a litigant from seeking justice. A good thing that all NZ court proceedings are in the public domain. I don’t think the public would approve of such unfair tactics, especially at their expense. The court may not either. Unforuntately though, if a council in this situation were to be financially punished by the court, it would be their ratepayers who suffered. Now that might be something useful Local Government NZ could do – work out ethical guidelines for council litigation, because the only people guaranteed to win when matters go to court are the lawyers. Lawyers always win one way or the other. I understand our Mayor has already been using the services of an Auckland defamation specialist lawyer at the direct cost to the ratepayers. That in itself is bad enough, but IMO [this is] an open and shut case of blatant bullying from the pulpit, that has backfired due entirely to the mettle of the plaintiff, Cr Lee Vandervis. Say or think what you like re the plaintiff, but if one looks again at the video one cannot come to any other conclusion but that our Mayor has exceeded the bounds of decent and correct behaviour. But a mitigating factor is the total enmity of our Mayor towards Cr Vandervis, which has blinded him to any form of justice or fairness towards his fellow councillor in this and other instances. As a candidate for the Presidency of the LGNZ he would be less than suitable, as this story suggests. Agree that the average reasonable person looking at the meeting video would conclude that the mayor had gone too far calling any councillor a liar and doing so repeatedly and emphatically. I was present at the meeting and really shocked by it. But what concerns me even more is that not a single other councillor dared to call a Point of Order. Nor was there any suggestion after the meeting of a Code of Conduct complaint. I made one myself (new revised Standing Orders no longer allow members of the public to do this) but Cr Staynes, the deputy mayor to whom the complaint must first be addressed, found no reason to proceed. All our councillors make a solemn declaration to uphold the law on taking up office. I believe they did not do so on this occasion, whether through gutlessness, ignorance or apathy. If they had upheld their own meeting rules, ratepayers would not be bearing the cost of legal attempts to defend the mayor’s behaviour, the cost of which was last reported at over $30,000 and is surely considerably more now. All because of a lack of three words: ‘I’m sorry’ and a lack of self-control and good manners in the first place. Hope some better precedents are set as a consequence of this shameful debacle. Mr Mayor, let’s not forget, was not just the Mayor at the Council meeting: was not an impartial chair. One has to say that the use of ‘judge alone’ trials merely aggravates the issue of reversal of burden of proof in this country for this kind of case. Juries are not used because they are infallible, but because it is hard to ‘get to’ anybody who is on one before they deliver a potentially convenient or inconvenient verdict. In this country as in the UK you do not know who you are trying until you are led into the court. The US system is different – and is vulnerable as a consequence – remember the final scenes of the ‘The Untouchables’ at Al Capone’s trial. Judges by contrast are extremely easy to ‘get to’ as they are few in number highly visible, are in place for a long time, and can control important decisions – especially if they are acting alone.as they are apparently in this case. It is surely reasonable to believe that judges are human (rather than super) beings. However, we instead seem to assume that the judicial community are for some reason totally immune to the processes of targeted penetration, socialisation, subversion and even blackmail that other key decision maker communities are widely acknowledged to be highly vulnerable to. Refer again to the final scenes of ‘The Untouchables’ at Al Capone’s trial..
Any move of white collar crime to a non-jury format surely relies upon such an assumption. One final thought…. It seems that if Al Capone was operating in New Zealand (or Balclutha at least) today he could have assured his position by making all of his lieutenants to sign confidentiality clauses as part of their employment contracts. Then apparently they would not have to cooperate with the police or testify in court against them with regard to any reported naughtinesses. The whole thing apparenlty just goes away due to ‘lack of evidence’ and nobody has to get killed – Sweet! . . .
Maybe everyone at LGNZ requires a letter describing Mr Mayor and his actions. 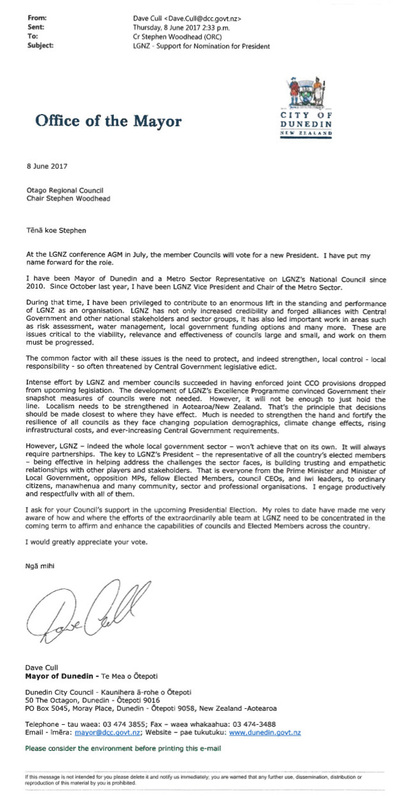 When voting for this position, LGNZ members should consider the degree of community respect each of the candidates has mustered in the community over the years. Does the candidate hold their office with dignity, is the candidate divisive, fair, or petty/vindictive in any way? Are they straight shooters or do they speak in political cliches? This may be hard to judge from afar, but those voting should do their homework on the personalities standing because what they appear to positively present may not be borne out in reality. 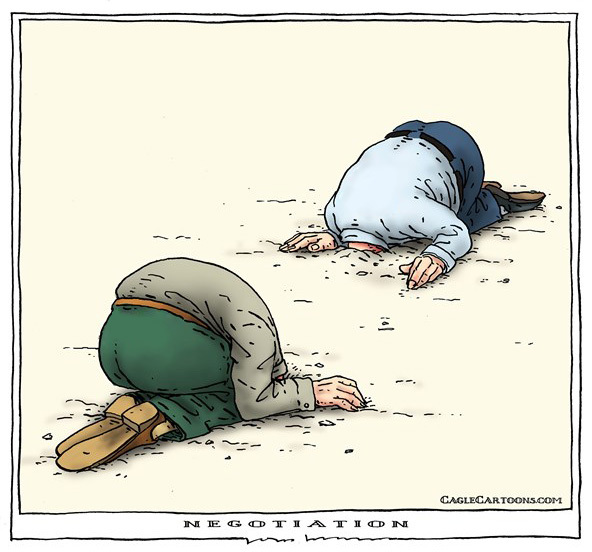 As foreseen, a settlement has been reached out of court with Mr Mayor to ‘furnish’ Cr Vandervis with a tidy sum. However, so mangled has representation been in proceedings that no apology has been ordered and neither was application made for a jury trial on Cr Vandervis’ behalf. A total mess – and the sum, we trust, from own pocket not that of ratepayers. Mayoral vehicles. The 2017 Hyundai Santa Fe ($55,777.60) replacing the 2016 Hyundai Santa Fe ($55,659.00) written off in January this year near Roxburgh is worth, shall we say, slightly more than the princely sum owed to Cr Vandervis in negotiated settlement —and a sum far greater than the startlingly misrepresentative worth of camel shackles. Another pre requisite for LGNZ President. An ability to show grace, by issuing an apology, when caught out for saying or doing something wrong. Will be interesting to see how ODT reports on the issue. If it does. What about the apology to us for legal expenses on our tab? 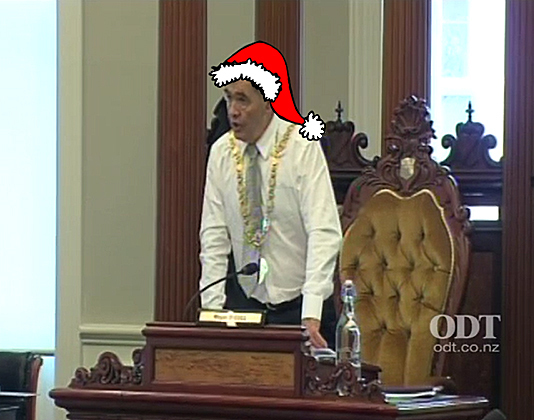 For making Dunedin look like Hicksville where voters inadvisedly rewarded bad attitude and bad manners with a gold chain of office – and then got stuck with the bill for his rooster-ups? Without wanting to appear prejudicial about our Mayor I have grave concerns that anyone as Mayor of Dunedin could do adequate justice to both roles. Hastings is not Dunedin. 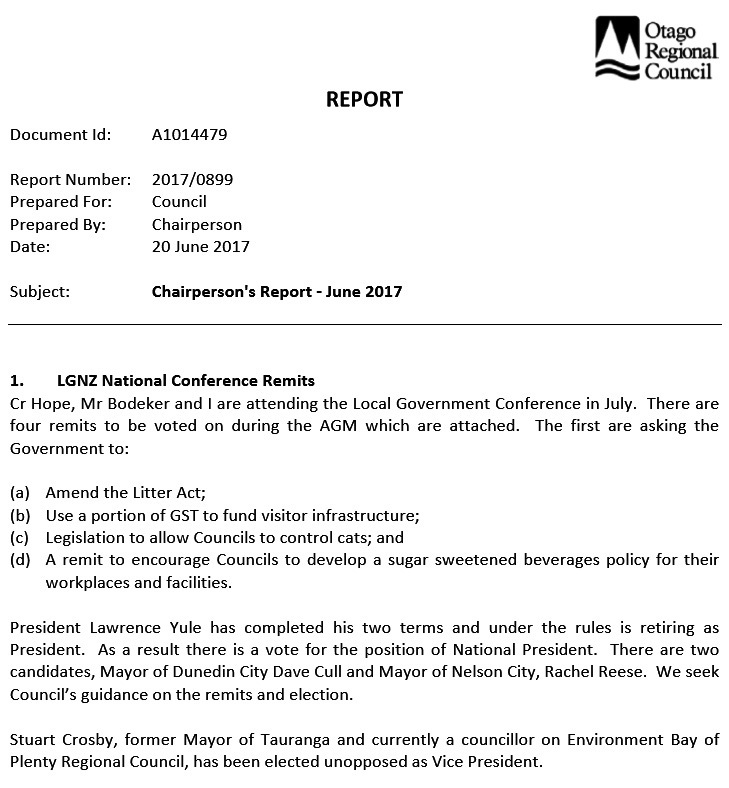 The incumbent LGNZ President has presided over a Council roundly condemned for putting his community in a serious state with deaths and serious illness from drinking contaminated drinking water. It might be said that he was derelict in carrying out his basic duties when it came to the provision of safe water. Isn’t it ironic that the pretender to the throne has a history of also ignoring the basic responsibilities of local government while actively pursuing vanity projects? Now ODT has reported on the defamation case against the mayor, I wonder if the total amount the DCC spent on legal fees in the mayor’s defence will be public information. Sure, this will be paid by the Council’s insurers but if the insurers consider the risks of litigation increased in any way, they might increase their premiums. So more costs to the ratepayers in addition to the $50,000 excess already paid out by the DCC in settlement. Hard to see how there’s any justice in these costs to ratepayers incurred just so that the mayor can publicly call someone a liar with impunity. It should be possible to carry out the mayoral duties perfectly well without doing that. The only ‘precedent’ set from all this is that the way things presently stand in Dunedin, the mayor could publicly call anyone anything and they would be wise to just grin and bear it. However, the DCC itself seems extremely sensitive to criticism. Anybody taking or facing legal action must research their legal representation —Thoroughly, as you would in seeking quotations from local builders, surgeons or valuers of precious stones – based on your fulsome study and understanding of their past work and clean track record (or not), along with several balanced recommendations from former clients etc. No one should go in blindly or be led by what other people think is good for you. You are the only one who should make the call – and be prepared to spend more if dickheads and pink feathered canaries abound in the local turkey run. Your number crunching for potential costs and contingencies should be meticulous against the legal strategies and evidence at your disposal. You have to be better than the representation in all ways. You are the project manager, no less, bringing the project in on time and within budget. The recipe to make serious money. Calling someone a liar used to be both heavy and light-hearted fun. Cartoonesque! Now there’s a tribe of shiny suited bastards creaming it when authorities and insurers cover protagonists at someone else’s expense, when the real payers are not at all connected to the action —other than viewing/hearing the word LIAR strongly, unmistakably stated on TV or computer, or reading it in the inked pages of mainstream media. What a ducking factory it is. I was reminded of this by the parson bird, Mr Tui, who has come to reside in our trees each morning during this bout of cold weather. He preens his shiny plumage in the high branches yet half his song heard as we’re waking resembles that of a black rook or callow magpie. Because this is the city we can’t use a discriminating air pistol to bring back order to quiet awakenings. First up was Fairfax last night (since updated). 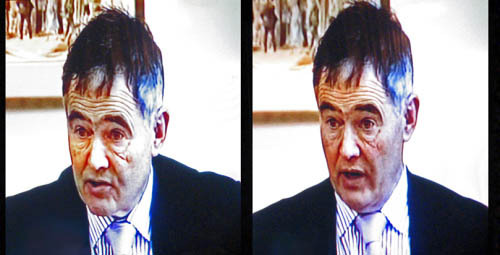 Dunedin Mayor Dave Cull was sued for defamation. We will never know if Cr Vandervis could have won the case before a jury. He should have thought about that before he signed his life away with this settlement. Sometimes your expensive friends need to stump up and stop twiddling in the bloody background. I wish Lee Vandervis had put out a “Fund me” call. But unlike ______ he’s not into bludging, he’s not a man to ask for money from the public even though in this case anyone who donated would have been doing so voluntarily, not as forced ratepayers. If you considered your case was strong and likely to prevail if it had gone to trial. Why would you agree to pay out $50,000 of someone else’s money. After all that could have been nearly enough to buy a Santa Fe. A report from Finance advised Council staff had reviewed and updated the Procurement Policy. The Policy had been considered by the Audit and Risk Subcommittee and was now brought to Council for approval. “That the Audit and Risk Subcommittee recommend the draft Procurement Policy for adoption at the next Council meeting. It was noted during discussion that the term “vendors” would be changed to “suppliers”. During the course of discussion Councillor Vandervis commented on a tender he had been involved with some years previously, details of which he stated he had reported to the Mayor. Mayor Cull requested him not to make allegations in public without evidence and subsequently asked him to leave the meeting as he had created disorder and no evidence had been produced for his allegations. Councillor Vandervis left the meeting at 4.18 pm. Mayor Cull then advised the Council that no allegations made by Councillor Vandervis had been backed up by evidence given either to him or the current or previous Chief Executive Officers. The motion was then put and carried. Ugh, have been nervous before making a public forum submission to a council before but not because I might open my mouth and put my foot in it with no intention of being defamatory at all. I am not at all sure what I am ‘allowed’ to say and not say. You would think ‘the truth’ – in other words, ‘honest opinion’ – would be a pretty good guide but apparently not. However, have learnt my lesson and let me comment that, in a purely hypothetical case, if I were ever to form the opinion that a councillor had been trying to pull the wool over the council’s eyes by using a trickily worded motion, then rather than address that directly (which amounts to the prohibited criticism of an individual), I might instead criticise the whole council for falling for it. Or, expressed more politely, for not properly scrutinising all parts of a motion. Critising the council is not specifically prohibited by Standing Orders, as long as the speaker is not being offensive. However, ‘not prohibited’ doesn’t necessarily mean ‘allowed’. (There is a great series of national jokes, probably all politically incorrect, along these lines, such as in France everything prohibited being allowed and in Communist Russia everything not prohibited being compulsory). Or don’t foul in my house ?